Bolivia features on many backpackers’ travel lists, and for very good reason. It has a very cheap cost of living, wonderful attractions, a large indigenous population, it is easy to meet fellow travellers, the scenery is stunningly breath-taking, and it provides a truly authentic experience for visitors. There are decent hostels in many of the major towns and cities where backpackers can stay for very cheap. Bolivian food is also inexpensive, and whilst transport can often be frustrating, with some patience, tolerance and a smile backpackers usually don’t find it too difficult to get where they want to go. Shopping is also very expensive and in many cases cheaper than the neighbouring countries. Bolivia is an ideal place to stock up on souvenirs to take or send home. Although the country is very poor, the local people are, for the most part, very welcoming, kind, and happy to see foreigners. It is not unusual for backpackers to be taken under the wing of a person or group for the evening and treated like an honoured guest. As with anywhere in the world though, backpackers should be initially wary of any strangers they meet, avoid flashing expensive gadgets or jewellery and should not carry excessive amounts of cash on their person. When backpacking around South America, Bolivia is a prime spot to just rest a while, unwind, hang out and refresh. The country’s easy-going nature makes this really easy to do. Many backpackers find that when they just want somewhere to stop for a while, instead of being constantly on the move, Bolivia is the place to do so. As the majority of Bolivia sits at altitudes higher than most visitors are used to, it is important that people take regular stops when walking around, as walking at altitude can make people tire easily. It is also important to fully acclimatise before doing any hiking or climbing, and if you feel ill at any point to make your way to lower ground as soon as possible. Soaring into the air, snow-topped peaks with incredible views, hikes and an abundance of wildlife and nature make the Andes a major draw of Bolivia. Trekking in this spectacular area is a firm favourite for all visitors. Organised routes can be enjoyed with the assistance of experienced guides and hardy mules. The lush, virgin rainforests offer backpackers the chance to truly get close to nature and see things that they can only dream about. Visitors can choose from a variety of tour companies to take them deep into the rainforests by foot or by canoe, and Bolivia is one of the most cost effective places to have this incredible experience. The world’s largest salt flat is found in Bolivia, and is an unforgettable viewing experience. Stretching as far as the can see, the salt flats reach to the horizon, providing picturesque and photo perfect views. Impossibly flat, the highest variation in the entire 4000 mile area is a mere one metre. The country’s exciting capital city is a must do when in Bolivia. A genuine South American city, it allows you a chance to really immerse yourself in the Bolivian culture. There is also a good night scene to enjoy a bit of partying and meet other travellers on the road. 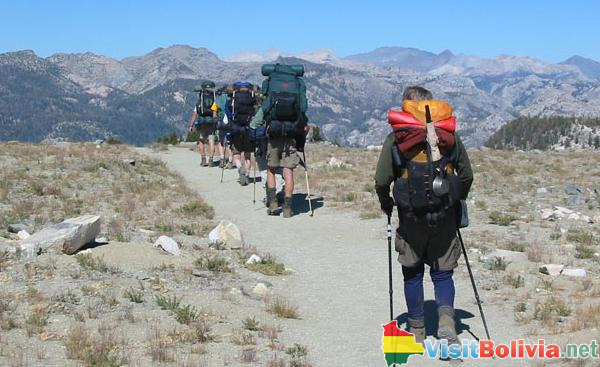 Backpackers can follow in the footsteps of the legendary revolutionary, trekking from Santa Cruz to La Higuera. Taking in many rural destinations along the way, the trek is the ideal way to see “real” Bolivia, and there is a fascinating museum to also enjoy. Not for the faint hearted, visitors are drawn to the sheer beauty, and adrenalin fuelled feelings, at the notorious Death Road. It is important that one visits through a reputable company, with the best safety standards and equipment. Known as the most dangerous road in the world, it really is a once in a lifetime experience, and perhaps one that, although happy you have done it, you will never want to repeat! As well as seeing the incredible mines, visitors will also have the chance to visit some of miners who tirelessly toil in these mines. Although at times the mines can seem very dangerous and intimidating, you can also take a glimpse into the other side of Bolivia and the hard work carried out every day by the miners. Visit Bolivia for a completely different and fun time, filled with intrigue and interest at every turn.